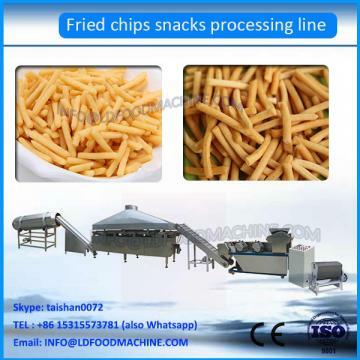 Automatic Fried Sala Ball Wheat Snacks Food Bugle Chips machinery uses double screw extruding technique to replace the traditional steam boiling process. It includes mixing, Cook, extruding, and shaping process, no needing boiler, with simple process, high efficiency and little pollution. The raw materials can be rice powder, corn powder, wheat flour individually or their mixture. 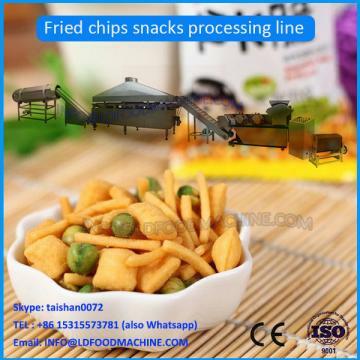 Only by changing the moulds, shaping or cutting machinery, the shapes can be various: Sticks, square sheet rib chips, diamond chips, wavy chips, pillow shapes and bugles etc. The taste is good and no greasiness. 2) use wheat flour as main materials, and other nutritional ingredients can be added. 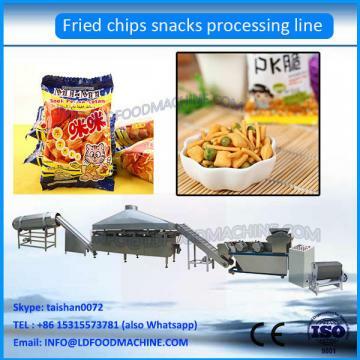 3) can produce flour bugles in different sizes, you can also produce fish shapes, moon shapes etc. by changing the processing rollers of the shaper. 5) convenient operation and maintenance, low power consumption, high output are its characteristics. We can supply your different models extruder according to your targer capCity . With a same extruder , you can produce different shapes of food by changing different moulds . It is used for drying . The net belt running speed can be controlled to change the food drying time in the dryer . The temperature alto can be controlled . We can be resonsible for the shipping ,of course,we can also accept and cooperate with your agent if you have shippingforwarder in China.